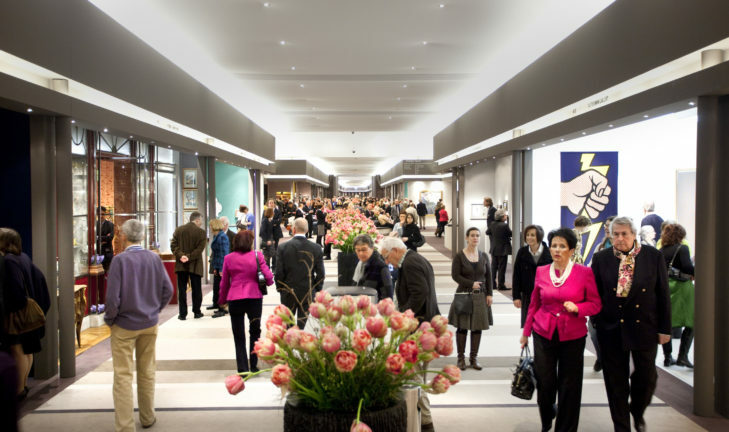 Over the years TEFAF Maastricht has established an unrivalled reputation as the world’s leading fair for art, antiques and design. TEFAF was born 30 years ago in Maastricht, a picturesque medieval-era city in the southernmost Dutch province of Limburg, built on Roman ruins, with a vibrant cultural life. In the 1980s two fairs – Antiquairs International, an antiques fair, and Pictura Fine Art Fair, for paintings – merged to become a new entity; in 1988 it was renamed The European Fine Art Fair (TEFAF), relocating to the Maastricht Exhibition and Congress Centre (MECC), which had just been built. Since then, the fair has grown exponentially and today it is a destination for collectors, curators, museum directors, conservators and all other lovers of arts and antiques. The fair only continued to grow, adding sections to its roster based on both gallery and patron interest. The Modern and Contemporary Painting section was added in 1991, followed by La Haute Joaillerie du Monde in 1992, and Books, Manuscripts & Maps, plus Classical Antiquities in 1993. TEFAF Paper, a section devoted entirely to artworks on paper, was established in 2006. In 2009 a new section, called TEFAF Design, was introduced to strengthen its appeal in a field which attracts a growing number of private and professional collectors. TEFAF Maastricht now has eight sections spread across more than 30,000 square meters (about 100,000 square feet) of the MECC, offering about 35,000 objects for sale from every conceivable form and genre of art and antiques. TEFAF Maastricht continually improves the breadth, quality and display of artworks, while at the same time presenting memorable exhibitions and ground-breaking research that have changed the way the fine art world does business. By appointment in Amsterdam and Paris.